For as long as I can remember I have loved blue cheese! Even as a kid, it was my favorite salad dressing whether it was creamy or dry crumbled with a vinaigrette. I can remember coming home from school and fixing a bowl of blue cheese crumbles, vinegar and oil then dipping carrots in it. 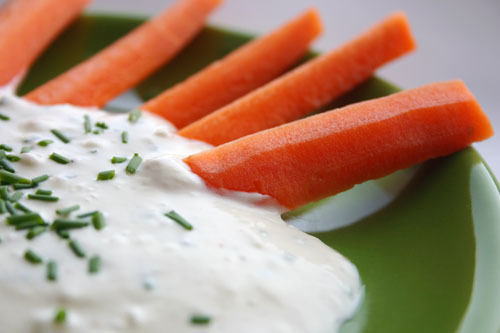 Now that I’m older, I’ve discovered lots of new ways to eat blue cheese but I still love it on salads and I still like to dip my carrots in it for an afternoon snack. Here’s a dip I made up yesterday just for that purpose. The chives weren’t added until this morning when I went outside to water my plants and realized I hadn’t used any fresh chives for a while. I think they made the dip 10 times better! In a small bowl, mash together blue cheese and mayonnaise with a fork. Stir in remaining ingredients. Taste and season with additional salt and pepper if desired. Best if refrigerated for several hours. Stir once more before serving. Good with vegetables, chips or as a salad dressing. Enjoy! That looks great! I like to dip my french fries in blue cheese. I like the idea of a homemade blue cheese sauce - this looks great! that photograph looks so inviting. I've jus discovered your blog, its beautiful I will definitely be coming back for more salivations! Thanks everyone :-) Rachel I like my fries in Blue cheese too! Mae, the fried chicken breasts drizzled with blue cheese sound wonderful! Your pictures are amazing and your recipes are SOOOOO tempting! What do you use to photograph and are you a professional photographer? Beautiful page! this would be great with my hot wing sweet potatoe fries that i haven't developed yet!